I am white. That is to say, the pale pinkish color of my skin that Crayola used to call “flesh” puts me in the socially constructed category of “whiteness.” But I don’t typically think of myself as having a race. If you ask me to describe myself, there are lots of adjectives that will pop to mind before my skin color. And when I look at myself in the mirror, I don’t think about (or even really see) my race. When I walk into a new setting, I seldom if ever think about the fact that my whiteness has set me up to be the beneficiary of positive assumptions and privileges. As a result of the fact that I take my race for granted as invisible or non-existent, I have been insulated from discussions of race. When the subject of race comes up, I am likely to feel uncomfortable and incompetent. “What do I know about race?” I think. If someone points out my biases, I feel upset, embarrassed, and may become defensive or overly intellectual. My prejudice doesn’t match my cherished self-image as a progressive and as a good person, so I may try to deny my bias or to excuse it by the fact that it is unintentional. When I hear other white people make biased remarks, even if cringe inside, I am likely not to call them out it because I know or believe them to be basically good people and don’t want to make them (or myself) feel uncomfortable. I avoid the topic. I lack the resilience or strength to wrangle with racism. 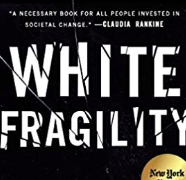 Diversity trainer and author Robin Diangelo, calls this phenomenon “White Fragility” in her insightful and provocative book from last year. Meanwhile, my brown skinned brothers and sisters have not had the luxury (or misfortune) to avoid the topic of race as I have. They inhabit the socially constructed category of “blackness” or “other.” When they look in the mirror or enter a new setting, chances are that race is in their consciousness. And American culture doesn’t let them ignore or deny their race. People may hold their purses tighter or cross the street to avoid them; a black person’s successes may lauded as exceptional and at the same time used as evidence that anyone can succeed in America if they just work hard; persons of color may be tokenized, or asked to speak for “their community”; they often learn to live by different sets of rules and develop different personas for different worlds. Their bodies are subject to police abuse, incarceration and violence. Being oblivious to race is not an option, and they must develop a muscle for dealing with and discussing race and racism. Don’t hide behind positive intent or let others do so. Saying, “I didn’t mean to offend you” does not absolve me. If I rely on positive intent to excuse me or give others a pass, I am ignoring impact. This has implications for my work as a facilitator. Historically, I have been in the habit of posting ground rules intended to create psychological safety for participants that include, “Assume positive intent.” However, Diangelo points out that this rule privileges the intent of the speaker over the experience of impact or harm to others. I don’t think intent is completely irrelevant – to me, malicious harm is different from unintended harm – but the focus should be on the harm, not the intent. Reject white solidarity – the implicit compact between whites that we won’t challenge each other on matters of race. We must pay attention and speak up when we detect bias, even if it makes our friends or us uncomfortable or is a buzz-kill. We ask our kids to be “upstanders” not bystanders in the face of bullying, and we must hold ourselves to the same high bar. Don’t make it about me. Many of the common reactions of white folks – defensiveness, withdrawal, tears, white guilt, accusations – put our experience at the center, which just continues the historical marginalization of people of color. Instead, I need to grow a thicker skin, stay engaged, and listen. Don’t refuse to see color or deny that I see color. By denying color, and trying to universalize experience, I deny the experience of people of color and miss an opportunity to learn. My first act in trying to combat white fragility is writing this post.